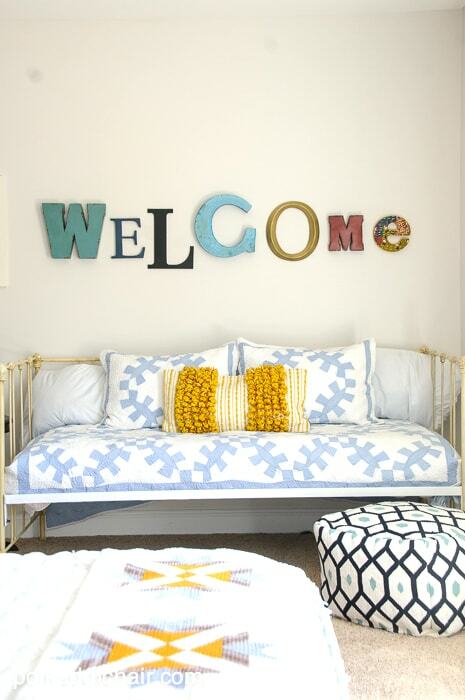 Love the colors you chose and that Welcome!! Happy reveal day! Your space turned out wonderful. I can’t wait to hear more about the headboard! I would redo our guest room. I’m totally inspired by you! Love how it turned out! 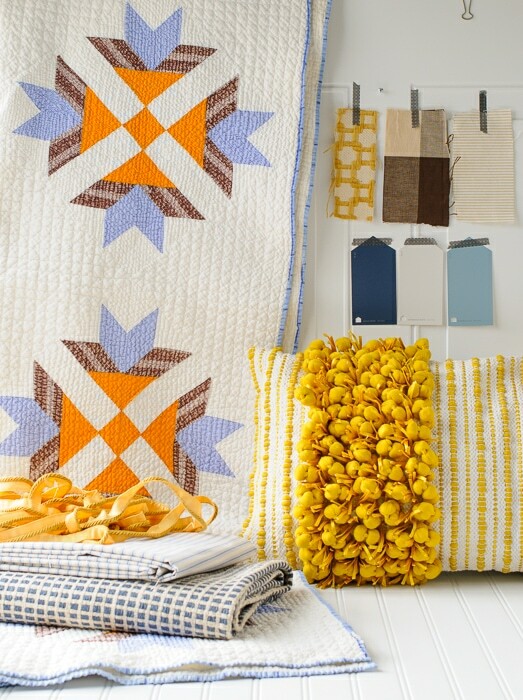 I also love the quilt at the foot of the bed– beautiful colors! Wow! You guys should be professional home decorators! Lovely! I would redo my family room. My son’s room needs a major makeover. I could use some paint in there, for sure! 🙂 Your room turned out beautiful – so sophisticated and modern! 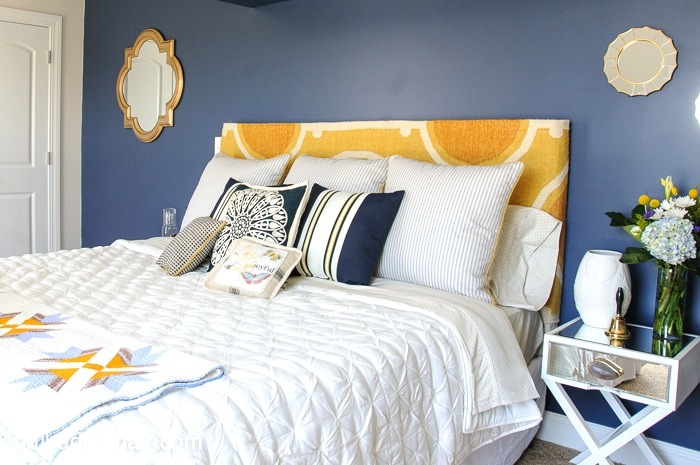 I love the yellow pillow on the daybed and the screen you used to cover the electrical box – gorgeous! My husband and I gutted our little master bathroom 3 years ago to re-do it top to bottom. Other projects and priorities came along and we still have not tackled it! It’s been empty and sadly used for random storage and a catch-all space since that time. 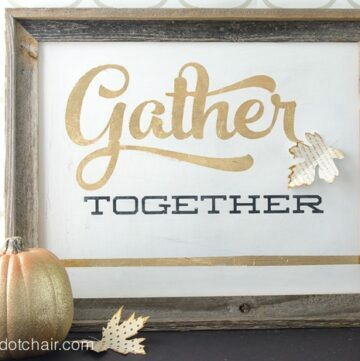 As seems to be the way, projects for the comfort of kids, the whole family, or the guests come first. 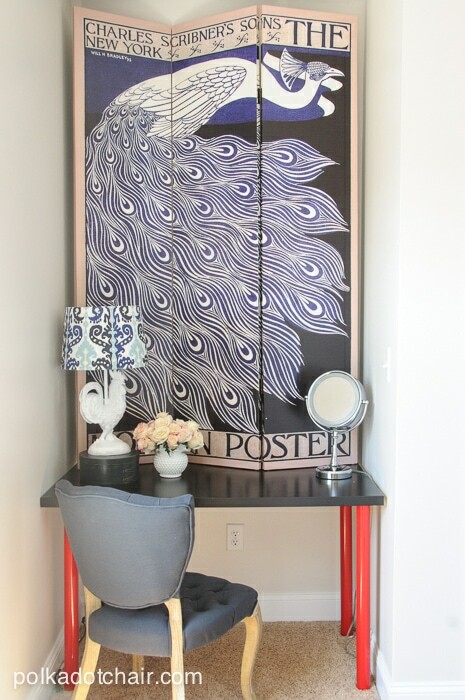 I would totally fix up our spot with Sherwin-Williams leading the charge! Beautiful! My bedroom is always the last one to get attention, so it’s time for new paint. Your project really inspired me! 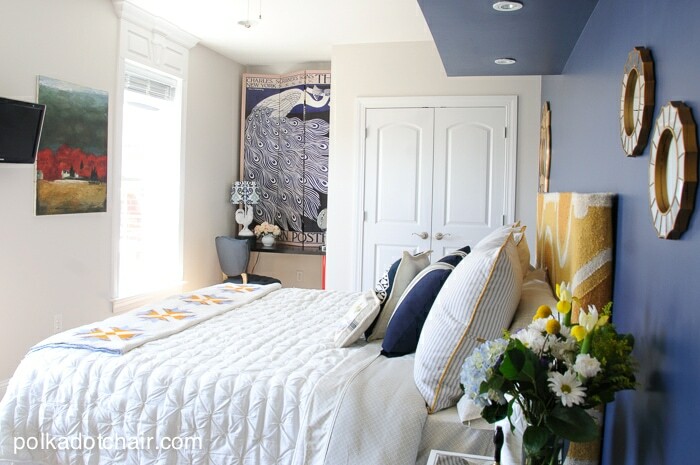 Beautiful room, I just love navy. 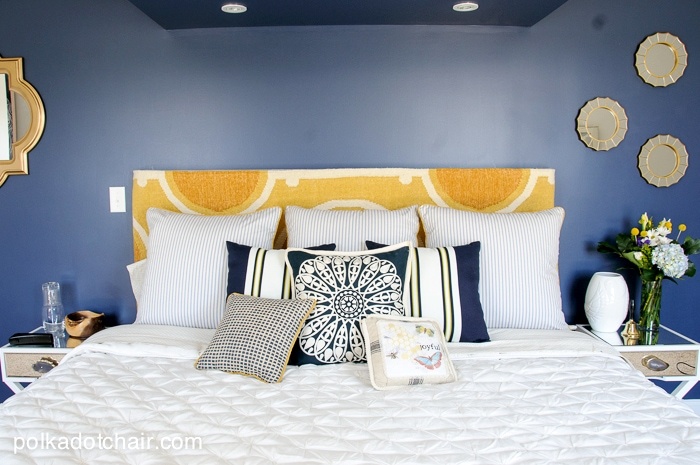 Love the navy wall and the idea of using a rug to cover the headboard. It turned out amazing! 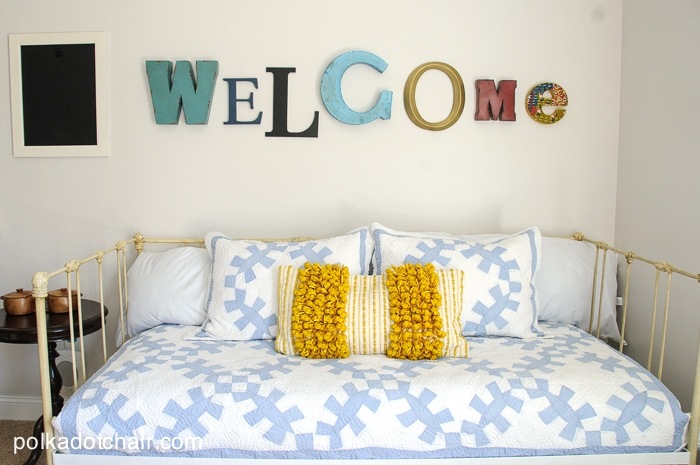 I am also redoing a guest room, you gave me some great ideas. 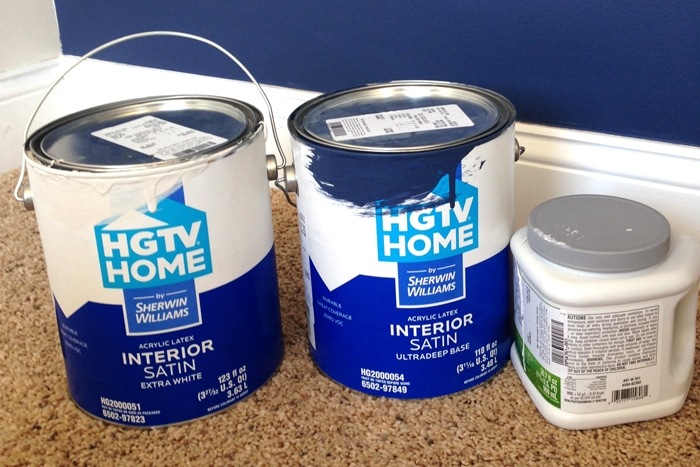 My living room needs the Sherwin Williams’ touch! I love the colors combination that you are using. Really nice looking. 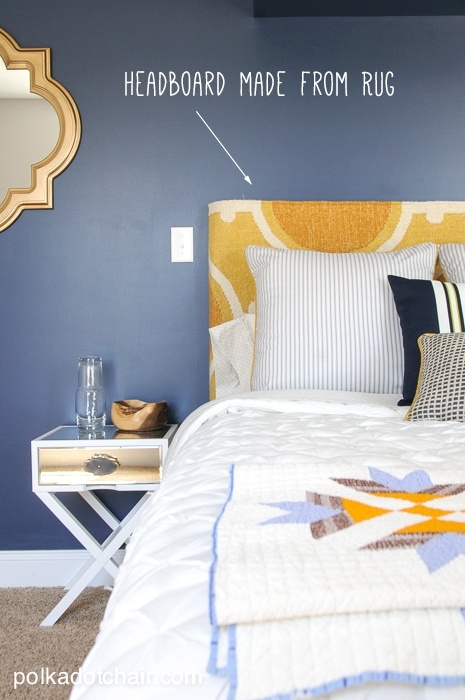 I love the headboard! I have certainly gained some inspiration from your blog post and can’t wait to look into doing some things. The room is STUNNING, Melissa!! Using the pint can is such a good idea, the bold colors are balanced so well, good job!!! Love it! 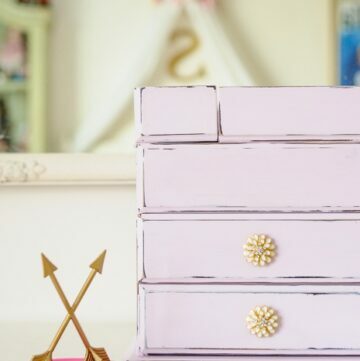 The ideas, the DIYs, the paint colors – great! I think my dining room is overdue for a facelift. 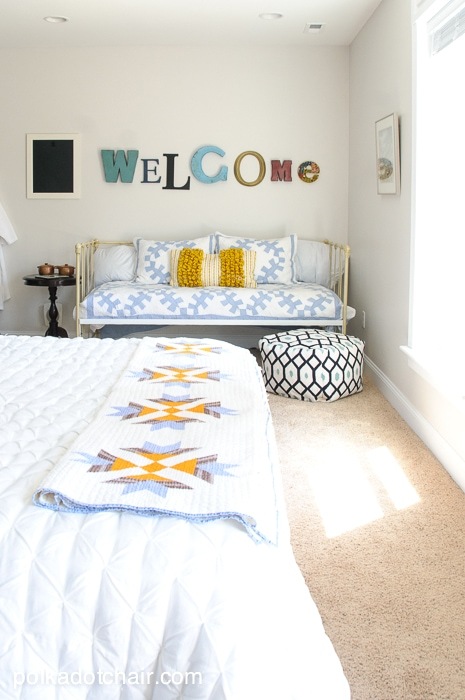 Your guest room turned out so well you may never get guests to leave! My sewing room could use a make over! 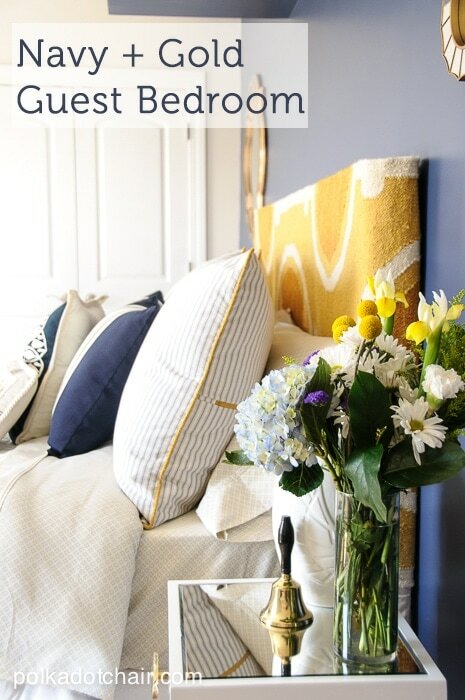 Love the navy and yellow. 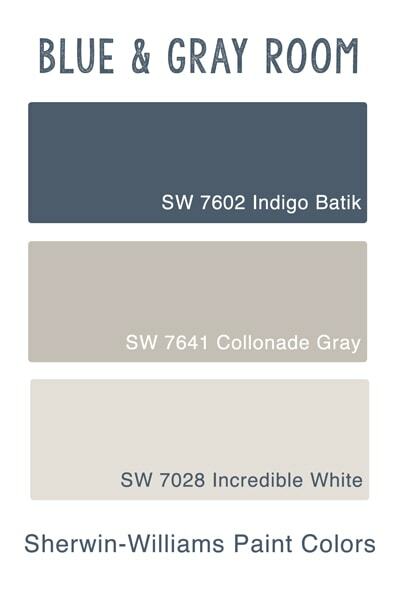 I’m going to be painting two bedrooms, I think the color for one is definitely going to be navy and white with yellow accents. Pick me, please!!! 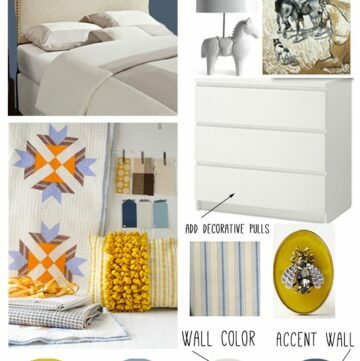 I’m in desperate need of a bedroom makeover!! My walls are toothpaste green and have never been repainted even when we moved in nine years ago! Love it! I’d like to make over my bedroom…the color on it now is just awful! I would makeover my laundry room, its rather depressing! that’s a great navy! 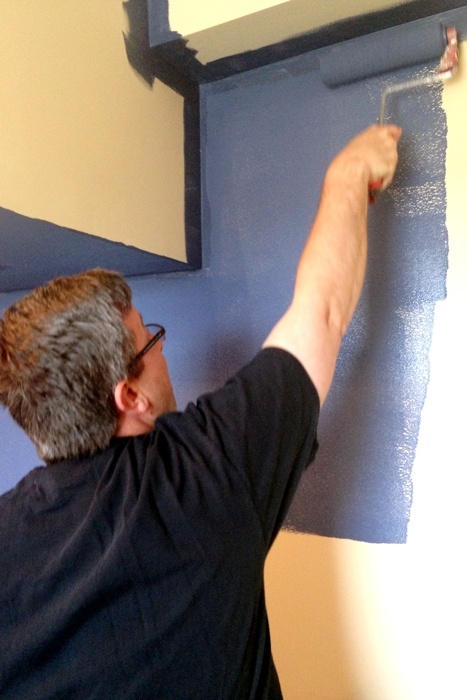 I need to find a good blue for my guest room, too. love this look! Melissa, congratulations. The room is beautiful. I love navy – it’s one of my all time favourite colours. 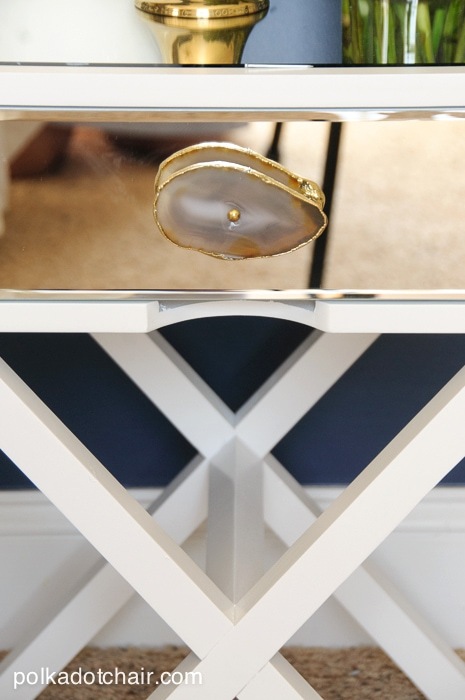 Where did the lamp with the glass/gold base come from? it’s stunning with the striped shade. I need to redo my bathroom. It is outdated and I want to make it look more modern. I love what you did with the room makeover. I’d like to do something interesting with my living room. It’s well past due for a change. Where are the nightstands from? What color carpeting is that? 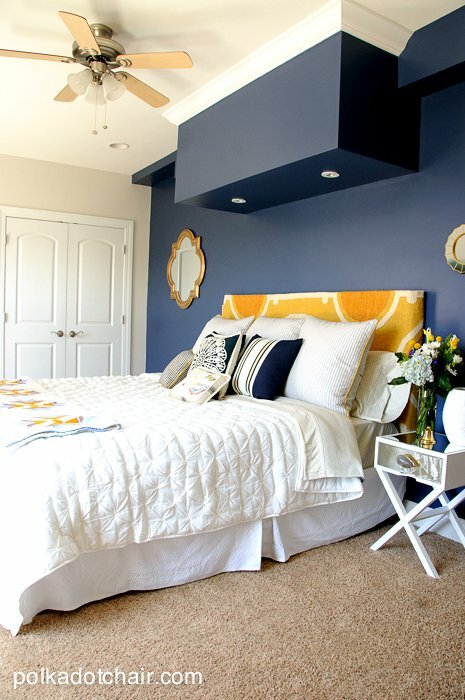 I’m redoing my bedroom, and am having trouble matching my navy wall color to a carpet. 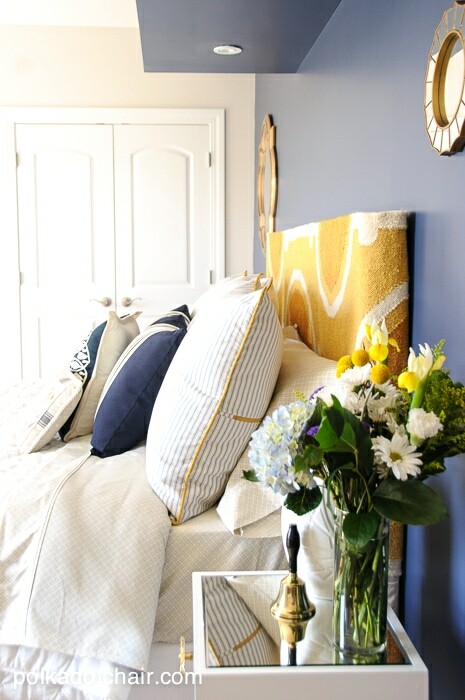 I also have a guest bedroom in navy/indigo and yellows/golds. 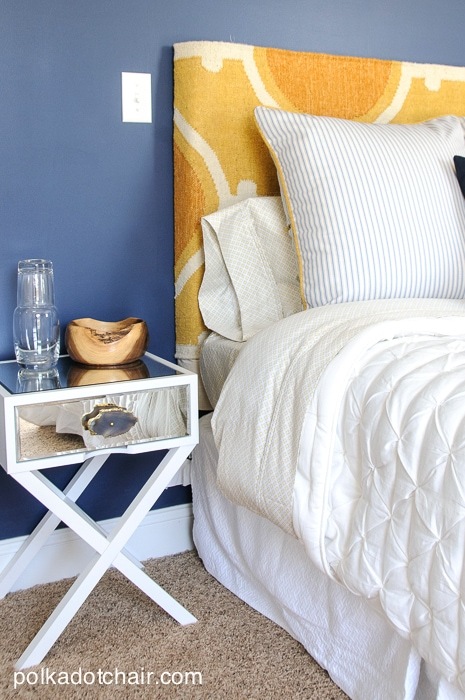 You might consider Krylon spray paint in Indigo and paint your daybed. I think you will like the pop it will give against the wall. 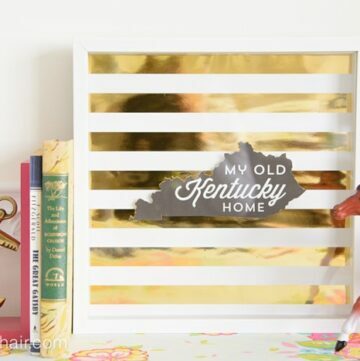 I did this with a very old iron bed in our guest bedroom, as well as a dresser, and bookcase, and some frames on the yellow walls. Some furniture I painted in matte, some in gloss, just to give some variety. Your room looks great. I really love that screen too. 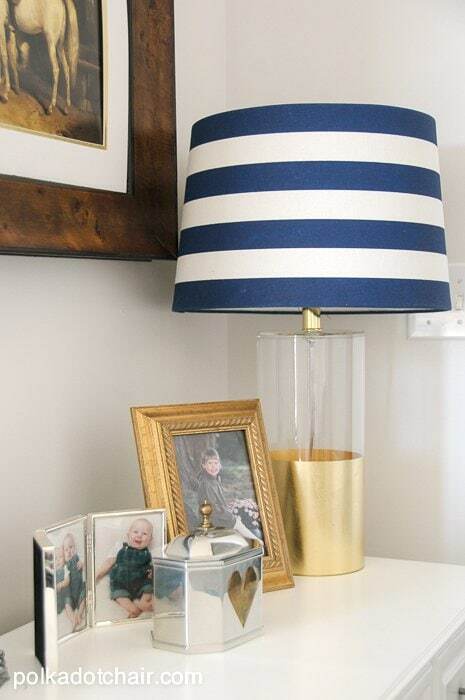 I was wondering where you got the glass with gold lamp with the navy and white stripe shade? It’s from Target… I got it last year but I think it might still be online. 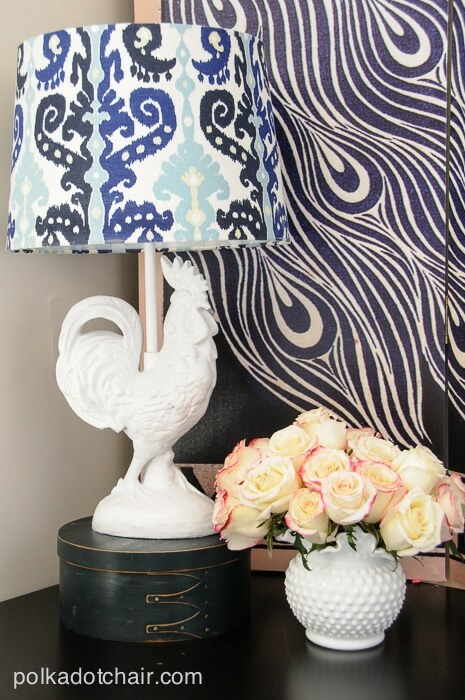 Love the Navy and white contrast. The yellow ties it all together.